There’s nothing like the smell (and the taste) of pancakes in the morning. But this easy protein pancake recipe isn’t just delicious; it’s the perfect high-protein healthy breakfast to support your keto lifestyle. With 6 grams of protein from grass-fed whey and just 2 net carbs, these low-carb, gluten-free, high-protein pancakes are perfect for breakfast or as a post-workout snack. 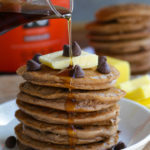 All you need is a nonstick skillet, some high-quality, delicious whey protein powder, and a few other simple ingredients and you’ll be on your way to healthy protein pancake paradise, no maple syrup needed. Most of the ingredients in these high-protein pancakes are good for your heart. One of the main ingredients, after all, is whey protein powder. Whey protein has been shown to help reduce high blood pressure and lower triglyceride levels. Whey also may improve insulin sensitivity and blood sugar levels, which decreases inflammation — a risk factor for heart disease[*][*]. Almond flour is also known for its heart-healthy properties, including reducing LDL or “bad” cholesterol and insulin resistance more than higher-carb wheat flower[*][*]. Coconut flour is also packed with healthy fats and nutrients that support heart health. MCTs — or medium chain triglycerides — promote weight loss[*], which is great for your heart. There’s also some research that suggests these fatty acids may reduce other risks for heart disease like bad cholesterol while raising good cholesterol[*][*]. Lutein and zeaxanthin, antioxidants found in orange and yellow foods like egg yolks, are also linked to heart health[*]. Eggs may also help increase HDL (high-density lipoproteins, aka “good” cholesterol) and lower LDL (low-density lipoproteins, aka “bad” cholesterol) and inflammation[*]. The ingredients in these healthy pancakes may also help support a healthy immune system. Whey also contains a protein called lactoferrin that can inhibit the growth of bacteria and fungi. This is great news for your body’s natural defense mechanisms and one of the main reasons whey is so good for your immune system[*]. Whey protein is also high in a compound called alpha-lactalbumin. Alpha-lactalbumin is high in the amino acid tryptophan, which is a precursor to the neurotransmitter serotonin[*]. More serotonin supports better memory, better sleep, and better mood and cognitive performance[*][*][*]. Eggs are also high in choline, a nutrient that helps produce acetylcholine, a neurotransmitter that supports memory, mood, and other brain functions[*]. Cook time and prep time are minimal with these keto protein pancakes, so you won’t have to worry about waiting until a lazy Sunday morning to whip up a batch. Only two simple steps stand between you and deliciously sweet protein pancakes, so what are you waiting for? Add all of your ingredients to a large bowl, except the sugar-free chocolate chips, and combine until the batter is nice and smooth. Now, fold in your chocolate chips and set your batter aside. Grease a pancake griddle or large, nonstick pan with a high-quality nonstick cooking spray, butter, or coconut oil. Preheat your pan to medium-high heat and pour the pancake batter into three-inch rounds. Wait for about 3-4 minutes, or until little bubbles start to form around the sides and the top of the pancake and then flip and cook for another 3-4 minutes. Once the pancake is cooked, plate it and repeat the process until you have 12 fluffy, healthy pancakes you can slather in butter and serve to your loved ones. And even though it might be tempting to top your protein pancakes with fresh fruit like apples, peaches, or pears — avoid these higher sugar fruits and opt for some berries or stevia-sweetened whipped cream. Add all ingredients (except chocolate chips) to a large bowl and mix well until smooth. Let your batter sit for 3-5 minutes until it thickens a little. Fold in your chocolate chips. Preheat a pan or griddle and coat with nonstick cooking spray, extra butter, or coconut oil. Cook pancakes 3-4 minutes per side until golden brown. Top with berries, keto syrup, or coconut whipped cream. Am I missing something? The batter turned out like thick unmanageable dough. Is there supposed to be a liquid element? I ended up lactose-free milk to make the batter workable, at least a cup… they did turn out perfect though! super tasty and fluffy! Wondering the same thing. Added a cup of almond milk, but don’t understand why something was not listed on the recipe.